CarGurus has 82,814 nationwide Grand Cherokee listings starting at $900. Driven with talent, a Grand Cherokee is just as unstoppable off-road as almost anything else rolling off of an assembly line. A 2014 Jeep Grand Cherokee is no mere boulder-bashing lifestyle vehicle, and while it proudly wears its “Trail Rated" badge, it is a more useful tool for daily living than many SUV buyers might assume. There are compromises to be made in exchange for a Grand Cherokee’s utility, much as there are downsides to carrying a Swiss Army knife, but Jeep has made significant progress in improving daily drivability without reducing ultimate off-roading capability. This is, without question, the most refined and capable Grand Cherokee yet. For two decades, the Jeep Grand Cherokee has been one of the most popular SUVs in America. Designed to go just about anywhere at just about any time, but with all the rough edges of a traditional SUV sanded off, the Detroit-built Grand Cherokee remains a popular choice despite the flocking of consumers to crossover SUVs that look rugged but drive like a car. 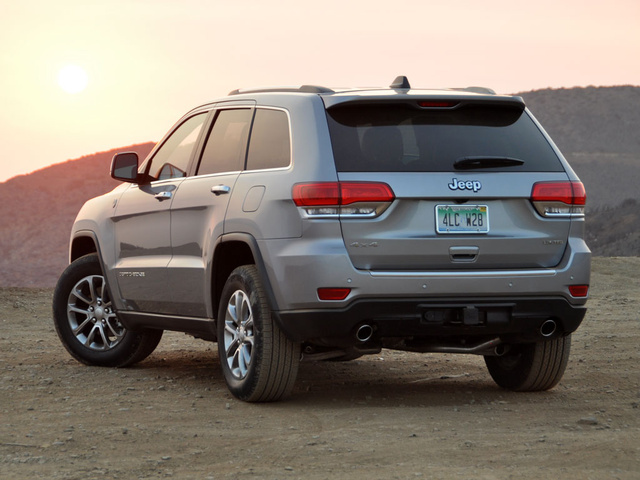 For 2014, Jeep has further refined the Grand Cherokee. Highlights include revised exterior styling, a reconfigured gauge cluster and dashboard, and available Uconnect Access, Selec-Speed Control and Forward Collision Warning with Crash Mitigation technologies. More importantly, fuel economy increases across the board, thanks to a new 8-speed automatic transmission. 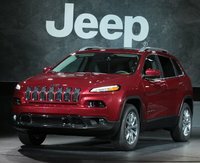 Jeep also offers a new clean-diesel V6 engine for the 2014 Grand Cherokee, a new luxury-themed Summit trim level debuts and the performance-oriented Grand Cherokee SRT gets a new Launch Control system, revised Track Mode programming and improved towing capacity. Jeep serves the Grand Cherokee in five flavors: Laredo, Limited, Overland, Summit and SRT. The latter is built for performance on pavement, while the rest deliver successive levels of luxury with a choice between rear-wheel drive (why would you bother?) and 4-wheel drive. My test vehicle is the Limited model, equipped with a V6 engine and 4-wheel drive, and painted Billet Silver with a Morocco Black leather interior. To the base price of $38,790, including the destination charge of $995, my Grand Cherokee added the Off-Road Adventure II Group, which includes a long list of powertrain, towing and underbody skid plate protection upgrades. The test model also had the Uconnect Access touchscreen infotainment and navigation system, for a total of $41,380. Jeep has massaged the Grand Cherokee’s styling for 2014, adding LED running lights and taillights, installing smaller but no less powerful headlights, and chopping height off the grille. The changes result in a good-looking SUV, though I prefer the bolder styling details of the 2011–2013 Grand Cherokee, which looked more rugged to my eye. The 2014 Grand Cherokee’s new dashboard looks good, and the new steering wheel has a fat, leather-wrapped rim and revised cruise and infotainment controls that are larger and well marked for easy reference. While some components feel less refined in operation than might be expected, the Grand Cherokee Limited’s cabin materials and execution are properly aligned with its sticker price. Performance is the Jeep Grand Cherokee’s reason for existence, whether you’re talking about traversing Colorado’s Alpine Loop, lapping Germany’s Nurburgring Nordschleife, crossing the crumbling roads of Southern California or towing up to 7,400 pounds of trailer. Thanks to its optional Off-Road Adventure II Group, my sample Grand Cherokee was ready to tackle the wilds of the Rocky Mountains, but I mostly used it to battle the decline and decay of Los Angeles, underlining an important point about the value of a traditional SUV in urban environments. A steady stream of trucks, buses, traffic and weather brutalize city streets, and in recent years municipal budgets have been sliced as infrastructure ages. Thanks to tough suspensions and tires with thicker sidewalls, an SUV is almost always better equipped than a crossover to handle daily driving duty on the cracked and heaving roads laced atop American cities. Not far from downtown L.A., the Santa Monica Mountains rise beyond Malibu beaches, and a determined Jeep driver can find patches of dirt that are accessible only to a genuine off-road vehicle and which haven’t been gated or chained-off to adventure seekers. Here, my test model’s surfeit of skid plates, Quadra-Drive II 4-wheel-drive system, Quadra-Lift air suspension, Selec-Speed hill descent management system and electronic locking rear differential certainly came in handy. And a full-size spare tire is always good to have on a trail, as it can mean the difference between making it back to base camp or sleeping in a Jeep. do other serious 4-wheelers, and visibility is of paramount importance on any trail. The rakish roofline that gives the Grand Cherokee its good looks also positions the driver lower and further back in the cabin. That’s fine for most types of driving. But when you’re creeping down Colorado’s Black Bear Pass, you want to sit up high and enjoy a panoramic view from the driver’s seat. Given that most Jeep buyers who are planning serious off-roading excursions are likely to choose the Wrangler, this is probably a non-issue, so let’s talk about the Grand Cherokee’s performance as a daily commuter and kid hauler. Equipped with a standard 290-horsepower, 3.6-liter V6 engine, the 2014 Grand Cherokee gets a new 8-speed automatic transmission designed to improve fuel economy. The gains are most noticeable on the highway, and our mixed-driving test average came out to 18.8 mpg despite the added weight of the heavy-duty off-roading components. That’s basically in line with the EPA’s combined driving rating of 19 mpg. To improve gas mileage, the transmission upshifts rapidly to help conserve fuel unless you accelerate like you mean it. It also delays downshifts unless you push hard on the accelerator pedal. These traits are a little irritating, but can be easily resolved by turning off the Eco driving mode. Alternatively, you could shift the transmission into Sport driving mode and shift your own gears using the paddle shifters, but c’mon, this is a Grand Cherokee without SRT trim that we’re talking about here. In any case, the V6 engine delivers decent acceleration, making the Grand Cherokee Limited 4WD a lively SUV despite its size and 4,875-pound heft. Those shifter paddles are also used to control the Jeep’s new Selec-Speed hill descent control technology, so they exist for more than just show. Dynamic calibrations designed to make the Grand Cherokee more capable off-road also work well in daily driving. The brakes are stout and easy to finesse, important traits for trail work that also translate to benefits in urban and suburban settings. Likewise, the Grand Cherokee’s super-tight turning radius is terrific both off-road and in cramped city parking situations, and the Jeep’s substantial ground clearance combined with generous approach and departure angles are useful in a variety of driving situations ranging from rock hopping to snugging front tires close to parking blocks tall enough to damage the bodywork of a mere crossover SUV. By now, you might be wondering where the compromises lie in choosing a Jeep Grand Cherokee. Mainly, they’re related to the SUV’s steering, suspension and handling under certain driving conditions. For instance, the Grand Cherokee’s electric steering feels light and disconnected on-center, which can make the SUV feel unsettled on the highway. This unsettled feeling is amplified by the high-riding nature of the beast coupled with suspension tuning that feels unexpectedly soft for a vehicle with serious off-roading capability. Over certain kinds of pavement undulations, the Grand Cherokee bounds, dips and sways more than expected, and while the Jeep’s longstanding tendency to generate lateral suspension rock, commonly referred to as “head toss,” is quelled in this latest iteration, the phenomenon remains a part of the experience. And if you’re thinking about buying one with rear-wheel drive—again, why bother?—know that the National Highway Traffic Safety Administration (NHTSA) gives such Grand Cherokees a lower rollover resistance rating of 3 stars out of 5 stars. There is a solution to these ride and handling quirks, of course. Get the Grand Cherokee SRT, and swap trail-rated exploring capability for track-ready performance tuning and a planted feel on the freeway. Just be prepared to use the new capless fuel filler system to feed that beast a steady diet of premium fuel. A new console-mounted e-Shifter accompanies the Grand Cherokee’s new 8-speed automatic transmission, and no matter how many Chrysler products I drive with this shifter, I have trouble getting the hang of it. As has happened in the past with this transmission, I often backed down my driveway and at the bottom selected Neutral instead of Drive, sitting in the middle of the street, uselessly revving the engine. This time around, in a parking garage with the Jeep’s nose facing a concrete wall, I accidentally put the Grand Cherokee into Drive instead of Reverse. Fortunately, I’ve learned to reference the gauge cluster display to see what gear the Jeep is in and to tentatively test to ensure I’ve got the right gear, so I didn’t plant the Jeep’s grille into the cement. Otherwise, the Grand Cherokee’s cabin is logically arranged and demonstrates remarkable simplicity for what is a fairly complex vehicle. Front seat comfort is excellent and relatively modest side bolsters help to make it easier to enter and exit the vehicle. The upper door panels are flat and soft, serving as excellent places to rest an arm or elbow while racking up miles on the Interstate. Rear seat passengers are unlikely to be as happy. The seat’s bottom cushion is mounted somewhat low to the floor, and the hard plastic front seatbacks are unfriendly to knees and shins that may contact them. Positive notes include relatively easy child-seat installation once you locate the rear LATCH anchor behind a carpeted panel in the cargo area, and the rear seats offer one-handed folding and produce a usefully flat cargo load floor when collapsed. That brings me to a second compromise forced by the Grand Cherokee’s dual-purpose mission requiring it to serve as both a daily driver and a multi-purpose tool: cargo space. 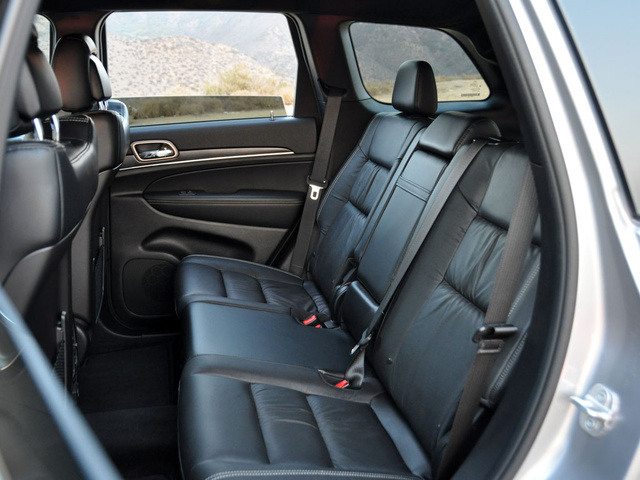 With the rear seat raised, the Grand Cherokee holds 36.3 cubic feet of cargo. Fold them down, and maximum space measures 68.3 cubic feet. Those numbers align with those of compact crossover SUVs. Many of the Grand Cherokee’s updates for the 2014 model year pertain to technology, including the addition of sophisticated new standard and optional exterior lighting systems, a configurable gauge display, new safety features and Selec-Speed descent control. The most useful upgrade, however, is the optional Uconnect Access system. Offering an 8.4-inch color touchscreen infotainment system with simple menus, crisp graphics and improved voice-recognition technology, Uconnect Access provides mobile Wi-Fi access, Bluetooth music streaming, hands-free text messaging and Emergency Call/9-1-1 service. Better yet, Uconnect Access is really easy to use. In addition to these features, my test car had a covered cubby bin equipped with an auxiliary audio input jack, a USB port, an SD card slot and a 12-volt power outlet located just in front of the shifter. 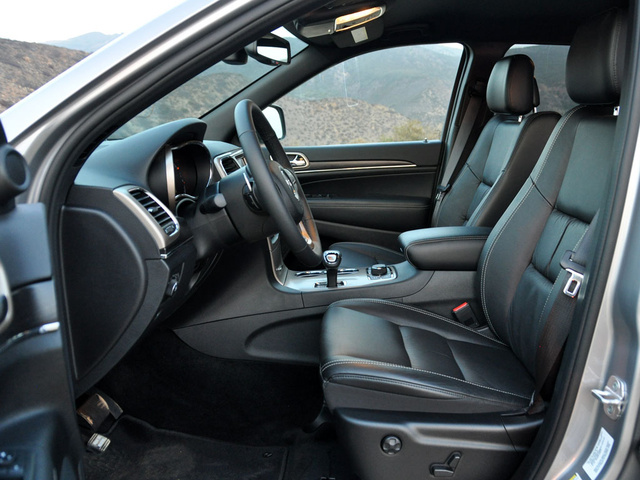 Rear seat passengers could access dual USB ports, a 3-prong 115-volt power outlet and heated rear seat controls, all located just beneath the rear air vents punched into the back of the center console. Clearly, there is no shortage of connectivity with a Jeep Grand Cherokee Limited. Jeep points out that the 2014 Grand Cherokee is offered with over 70 safety- and security-related features, including standard rain-brake support and ready-alert braking, a knee airbag for the driver and more. For 2014, a Forward Collision Warning system with Crash Mitigation joins the optional Advanced Technology Group, which also contains an Adaptive Cruise Control system, an advanced brake assist system and a Blind Spot Detection system with Rear Cross Path Detection. Additionally, Trailer Sway Control, rain-sensing wipers, adaptive headlights, run-flat tires and Call 9-1-1 services are available for the Grand Cherokee, depending on trim level. 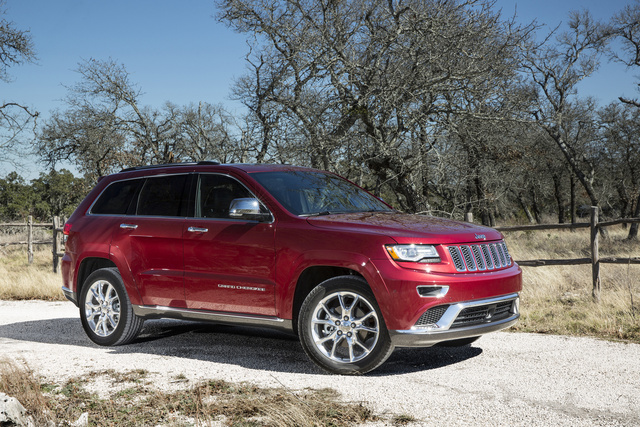 In crash tests performed by the NHTSA, the Grand Cherokee receives an overall rating of 4 stars. Rollover resistance rates 3 stars for the 2WD models and 4 stars for the 4WD models. The Insurance Institute for Highway Safety (IIHS) gives the Grand Cherokee the highest rating of Good in 4 of its 5 evaluations. As this review is written, the Grand Cherokee has not been evaluated in the new IIHS small overlap frontal-impact test. As mentioned earlier in this review, I got 18.8 mpg in a mix of highway, city, mountain and off-road driving, just short of the Grand Cherokee’s 19-mpg combined driving rating from the EPA. That’s impressive, given the Jeep’s powerful V6, 4-wheel-drive system and hefty curb weight. 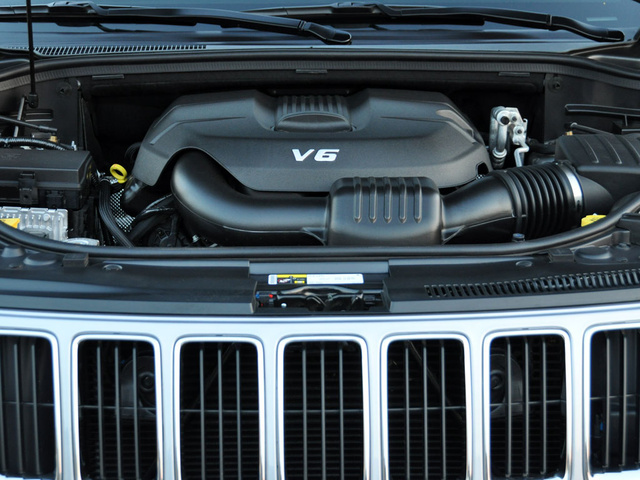 Keep in mind, however, that the Jeep’s available V8 powertrains are not as conservative with fuel as the standard V6. Additionally, Jeep dealers are usually offering rebates, low-rate financing and subsidized lease deals on the Grand Cherokee, making it easy to negotiate from invoice rather than the sticker price. 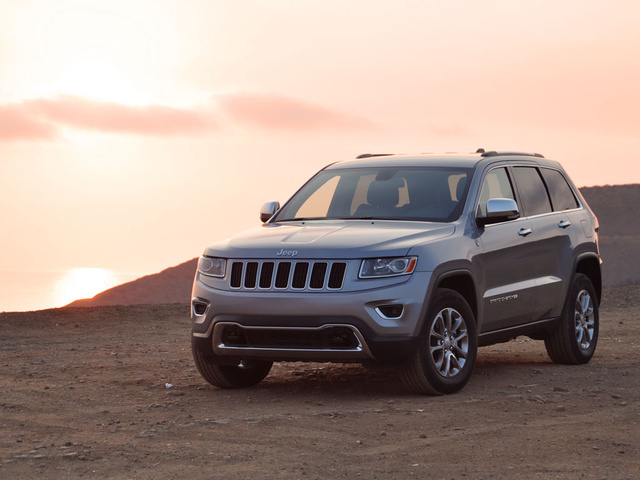 In terms of predicted reliability, the Grand Cherokee earns an average rating from both Consumer Reports and J.D. Power and Associates. Also, know that ALG gives the Grand Cherokee an unimpressive 2-star rating for its likelihood of depreciation over time. Perhaps the ability to bargain for a Grand Cherokee on the front end is necessary to offset risks associated with dependability and depreciation once it is parked in your driveway. Christian Wardlaw has nearly two decades of experience reviewing cars, and has served in editorial leadership roles with Edmunds, Autobytel, and J.D. Power and Associates. Chris prefers to focus on the cars people actually buy rather than the cars about which people dream, and emphasizes the importance of fuel economy and safety as much as how much fun a car is to drive. Chris is married to an automotive journalist, is the father of four daughters, and lives in Southern California. 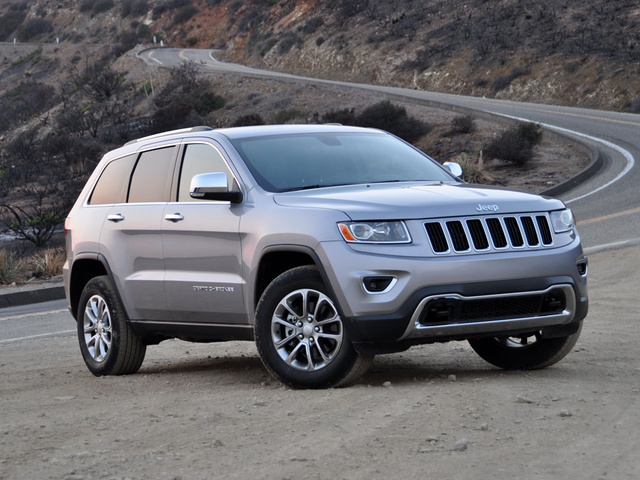 What's your take on the 2014 Jeep Grand Cherokee? dadshade How can I turn off the ECO driving mode in my 2013 SRT8? Users ranked 2014 Jeep Grand Cherokee against other cars which they drove/owned. Each ranking was based on 9 categories. Here is the summary of top rankings. Have you driven a 2014 Jeep Grand Cherokee? 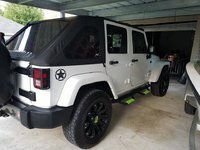 My 2014 Jeep Grand Cherokee battery died. I jumped it off and it ran for about a minute then shut off with all the dash lights coming on. Does that meN the computer needs resetting? Rear window works on both switches, when the door is open, but doesn't work on either switches when door is shut. Anybody have their ‘14Jeep GC come to a screeching halt when it perceives an immanent crash? My jeep grand cherokee limited 2014 lifters are making noise i oil change but dont stop ¿can someone help please, what chould i do? Is it dangerous?